Two young women, living one hundred-fifty years apart, both accused of madness, communicate across time to fight a common enemy . . . their doctors. Emilie Autumn's underground gothic phenomenon is born again in a completely re-imagined new version. If you were lucky enough to get your hands on the limited edition illustrated hardcover original, then you may think you know the whole story, but this...this is very, very different. With new characters, new chapters, new secrets, and new songs, the Asylum is back, and is admitting readers all over the world. This beautifully designed eBook version doubles as a treasure hunt, containing dozens of interactive elements including new illustrations, hidden links to additional writings and character backgrounds, atmospheric audio tracks to read along with, secret ways to get in contact with the Asylum's inmates yourself, and, if you're clever enough to find the key, exclusive access to never-before-heard songs from The Asylum for Wayward Victorian Girls: The Musical. Far from being second best to a print version, Emilie has packed this eBook with mysteries a printed book could never contain. There is quite a myriad of thoughts and feelings about this book on the interwebz, given that this is about the 4th(?) edition to be released by EA and the story has gone through quite a few changes. Full disclosure: I own and have read the first edition. I've been listening to Emilie's music for very many years. I even had her personally read excerpts of the book to me and a few other fans before one of her concerts the year before the 1st edition was released. You could say I'm familiar with the Asylum. However, none of the above will deter me from providing a completely truthful and unbiased (well, as much as one can be) review of the ebook. In fact, I think the prior context will help me describe where this book excels and where it may not. I read this ebook in about a day, mostly because I had the free time. My visceral first thought: i actually quite enjoyed it. In some ways moreso than the original, and in some ways less. One of my original criticisms of the first edition was the "purple prose" EA so enjoys employing. Now, as a personal preference I don't particularly mind purple prose, but I will say that the first edition sounded quite amateur at worst. I'm happy to report however that I feel EA went through this edition with a sharper eye and cleaned up a lot, making things more concise. Her writing style--whether in poetry, lyrics, and now literature--has always been one of... extravagance, and that certainly hasn't changed. But the stories both flowed better and the rhythm of the words was far smoother. One thing I am sad to have lost is how truly personal EA went with the first edition. In this ebook, she cut a majority of the "suicide diary" which went into more detail of what her life was like leading up to her eventual suicide attempt. We got some smidgens of that back with the "Confiscated files" at the end of the ebook, but even that was heavily edited and more stream of consciousness than actual chronicling of daily life. It's a give and take, I suppose. Many people decried her verboseness in the original, so perhaps she felt a need to cut things she didn't think were entirely pertinent. I do admit that perhaps I'm only missing it because I knew it was there to begin with, and a fresh reader with no such context will probably find the ebook as is to be incredibly personal and enough for them. So, I'm not counting this as a mark for or against the book, but just an observation. Now, onto the meat and bones. Let's begin first with the hospital diaries. They're largely unchanged in the beginning, but they too were cut down from original size and were even added to (which I will admit bothers me just a smidgen since EA has advertised this book previously as a totally accurate transposition of her diaries from her stay in the psych ward). In terms of content, I felt that they were mostly honest in their portrayal of the current health care system. I've also seen a lot of criticism levied against her for exaggerating the conditions, but just take a moment to think about it. Mental illnesses, specifically PTSD and depression, are incredibly pervasive in my life (won't go into further detail than that.) One thing that I know for certain is true across the board for anyone dealing with a mental illness is the absolute **necessity** to have a safe space. For instance, if someone with PTSD is ever made to feel truly unsafe--even in their own home--it triggers the fight or flight response into their brain and they have a panic attack. Putting someone like that in a cold and austere environment with virtually no support and only a constant stream of drugs is absolutely unsafe. I can absolutely understand why EA felt the psych ward was a horrible experience, because there was no safety and no actual help. However, I believe that's as far as I'll grant. Do I feel, from her own descriptions, that she was actively *mistreated*? No, I don't think she was. Not from the information she gave us, anyway. Keep in mind, I'm not trying to invalidate whatever experience EA may have had. It seems like the health care system is ill equipped to provide safe places for those who need it, and that can cause massive stress and trauma. But my point is that I don't think any of it was done on *purpose*. My only real issue with the hospital entries is that they too became small snippets of thoughts as the book went on, instead of actual depicting of life in the psych ward. If EA was aiming for an "accurate portrayal of life in an asylum" then I would've liked to see more of actual life in the hospital. However--the reason for that may lie in the fact that this book wasn't actually written about just one hospital stay. If you're curious about what I mean by that, do some sleuthing and you'll figure it out. To branch off from the above a little bit, there have also been criticisms against EA in terms of the veracity of her chronicling. Here is a truth: she's lied about several things before. Most notably, her family being dead when her mother and sisters are actually quite alive and well. But I suppose she has her reasons for that and I've personally never judged her for it. When it comes to the book, I do think she's telling the truth as she knows it--which is just as valid as anyone else's truth. The whole "never know another person's mind" argument, and all that philosophical goodness. If there's one thing I put stock in it's that EA told a story that's incredibly important to her and she was as honest as she could be. I'm going to interject a truly personal opinion here and say that accusing an abuse victim of lying or "making it up for attention" plays into the *exact* culture that normalizes the abuse and seeks to delegitimize women that speak out against it. Don't fall into that trap. 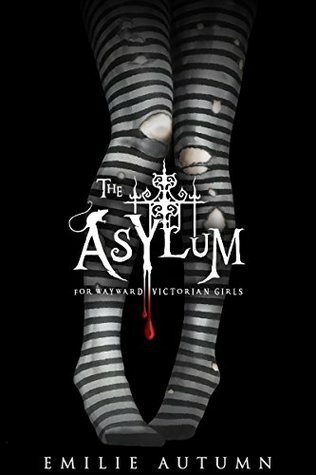 The Asylum story is very well written and certainly kept my rapt interest. Among her many other talents, I truly think Emilie is great at crafting a fantasy world and populating it with her motley cast of characters. I would've honestly loved a "full length" Asylum novel, that told the story exclusively and gave us even more of the the Captain and Veronica and the other inmates. Of course I understand the point is that they're "letters from another dimension" and I liked the effect that had as well. I also thought the small modifications to the Asylum story were for the best. Overall, I feel the Asylum part is something you'll have to read for yourself to form an opinion on. I enjoyed the crafted elements of it and the way things fit together even without being explicitly stated--you'll understand that after you read it. While I think saying this book is "the best account of bipolar disorder ever penned" (I'm slightly paraphrasing) is a bold and not quite true statement, I do think this was an interesting look into EA's mind in a way wholly unlike we get to see with her other work. Interestingly, I don't think this is the "rawest" version of her we've seen--I felt that her old journal entries on the forum she used to host were sometimes a bit more unedited and "real"--please take great care to notice the scare quotes I put around 'real' because I don't think the EA we see in this book is fake by any measure. Just a more polished presentation of her thoughts than what she had previously shown us online. There are quite a few interactive elements to this novel which were fun. Admittedly I didn't really focus on the hidden songs, and the ones I did manage to crack the code for were already released songs, so that's a feature I'll probably go back to. The treasure hunt hidden in the novel also seems fun, but I don't know if I want to try solving it. I tried my hand at the Enchant puzzle, which has been out in the world and unsolved for well over a decade, so if I'm honest I'm a *bit* skeptical about EA's puzzle making. But I do wish luck to all those who do attempt it! I think TAFWG is worth a read. I truly do. Will everyone like it? Probably not. It can be a polarizing book (please believe me when I say that is *not* a pun and none is intended) and there are a lot of things in the hospital diaries that I can see people taking the wrong way. Not to say that everyone EA writes is pristine, because she, like every other human on this planet, still has some problematic ideas about the world and prejudices that will come through in her work. But I also think she's speaking from a very personal place, and women in pain need to be heard. One of the most important things I believe is that people need to listen to women about their experiences--really listen, without the intention of responding, but just understanding. You don't have to agree with everything or even anything Emilie says, but I do think if you take the chance to read some of her innermost thoughts that you'll realize you're reading the story of a woman who is sharing her experiences and it's NOT your job to tell her they didn't happen or that she shouldn't feel a certain way about it. That's what I'll leave with. Emilie Autumn grew up by the sea in California where she mastered the classical violin before going on to travel the world as a singing theatrical performer and author. Globally known for her genre-bending album Fight Like A Girl, Emilie has also appeared as an actress, starring in Darren Lynn Bousman's musical fantasy films The Devil's Carnival and Alleluia! The Devil's Carnival. Emilie’s academic career ended abruptly at the age of ten when she was removed from school to allow her the time to perfect her musical craft, yet, despite her near-complete absence of formal education, her debut self-published novel (the early editions of The Asylum for Wayward Victorian Girls) seems to demonstrate some understanding of proper spelling and grammar, and has been cited in text-books used as part of the psychology curriculum at Oxford University in London. Upon the release of her 2007 Shakespearean-themed concept album, Opheliac, Emilie found herself an overnight star in Germany's industrial rock scene, and began touring extensively. With her Victorian burlesque-themed stage show and signature heart painted on her cheek (a unifying symbol devotedly replicated by her international fan base known as "Plague Rats"), Emilie fast became a sensation throughout Europe and the United Kingdom before touring in America, South America, Canada, and Russia. Diagnosed first with major depression in her early 20s and later with bipolar disorder, Emilie’s first novel (The Asylum…) was culled from the very real pages of the secret journal she kept whilst incarcerated in a mental hospital. She hopes that her future writings will not require such dramatic circumstances in order to be published. Since its fully-illustrated first edition hardcover release in 2008, The Asylum... continues to increase in popularity as Plague Rats around the globe cover themselves in tattoos from its elaborate art, cosplay as its eccentric characters (both human and animal), write their own fan-fiction, put on their own stage plays taking place in the "Asylum" world, arrange group tea party meet-ups, and incorporate Emilie's story into their own lives in virtually every imaginable way, beginning with the knowledge that what makes them different makes them magical and ought to be celebrated, not concealed. Emilie is presently composing and developing the Broadway musical and film versions of The Asylum for Wayward Victorian Girls. To follow her progress, join her on Twitter as @emilieautumn, on Instagram and Facebook as @emilieautumnofficial, and at her websites www.emilieautumn.com, www.theasylumforwaywardvictoriangirls.com, and www.theasylumemporium.com. This kindle edition was purchased by me for personal use. I was not compensated for this review, nor am I affiliated with Emilie Autumn in any way.